Each ornament in this new series will feature a different member of Santa's elite tree trimming team. 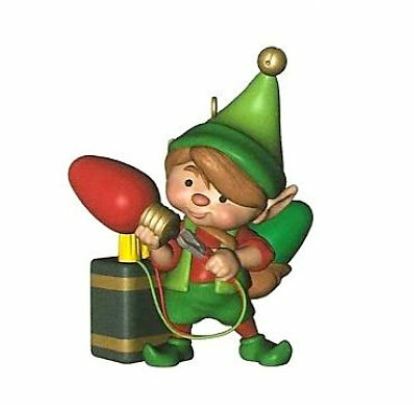 This Hallmark Keepsake ornament was originally offered as a Hallmark Gold Crown Exclusive. Very cute series. I also hope it continues for a long time. Great detail & colors. Makes you smile! Again, I missed another new series. I'm so lucky to have been able to purchase them through Hooked On Hallmark so I could catch up. This series is adorable, and my girls love them. I love how the little elves are working on ornaments and decorations to get ready for Christmas. I hope this series lasts a long, long time. Absolutely adorable and well-made. Will fit perfectly with my gingerbread houses village. 2008 Peek-Buster Elf - MOTION activated!